Xanthid crabs (Family Xanthidae) are a large, diverse group and are well represented in marine reef communities worldwide. They comprise one of the most species-rich families within the decapod crustacean infraorder Brachyura (the true crabs), with at least 640 species and still counting. The taxonomy and systematics of xanthids have been regarded by many workers as very complicated, and, as a consequence, this group has undergone substantial re-definition and re-organization over the past 170 years. However, the present system of classification remains imperfect, particularly in the definition of the component subfamilies. The xanthid crab fauna of the Philippines, which remains poorly known, is reviewed. Recent expeditions to the country have made it possible for an updated checklist of the Philippine Xanthidae to be compiled, the last comprehensive checklist having been published in 1959. The present additions contribute the largest increase in the number of xanthid species recorded from the country since the beginning of marine zoological exploration in the region. Most of the additional species are from the central Philippines, and were collected by the PANGLAO 2004 and 2005 expeditions. A total of 213 species, distributed among 78 genera and 12 subfamilies, are recorded. Of these, four genera and 15 species are new to Science, whereas 53 species, 13 genera and 1 subfamily are new records for the country. 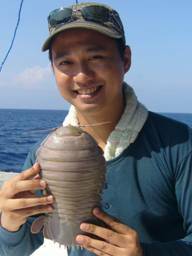 The prevalence of rare species and the high rate of discovery of new species from a small island in the central Philippines (notably Balicasag Island), presents an opportunity to study the decapod crustacean fauna of this well-explored area. It appears that such taxa previously thought rare were not properly sampled due to limitations in sampling gear and the resultant neglect of hard-to-reach, therefore unexplorable, habitats. There is the possibility, therefore, that some rare species are classified as rare because the optimal habitats, where they have a higher abundance, have not been properly sampled. One of the larger xanthid subfamilies, Euxanthinae Alcock, 1898, is revised. On the basis of previously under-appreciated morphological features, Euxanthinae is hereby restricted to 11 genera, including the type genus, Euxanthus Dana. The genus Glyptoxanthus A. Milne-Edwards is shown to possess enough distinct features to merit its recognition as a new subfamily, Glyptoxanthinae. Ladomedaeidae Števčić, is taken out from synonymy under Euxanthinae and placed under Antrocarcininae Ng & Chia. The remainder of the Euxanthinae sensu lato is also placed in Antrocarcininae on the basis of shared characters and, consequently, Antrocarcininae, now with 21 genera, is re-defined. The genera Medaeus Dana, Pseudomedaeus Guinot and Ulmo, gen. nov., are shown to be quite distinct from either Euxanthinae or Antrocarcininae, and are considered incertae sedis for the time being, pending a revision of the entire Xanthidae. This new system of classification is strongly supported by a molecular analysis of the Xanthidae (including Euxanthinae sensu lato), using four molecular markers. Five new genera and 12 new species are described as a result of this revision. “From a Facebook picture to a rare discovery,” by Esther Ng. Today online, 16 Apr 2011. “SINGAPORE – A picture on Facebook was all a group of National University of Singapore (NUS) students had as they began efforts to find the carcass belonging to a rare species of monkey. The photograph was of a banded leaf monkey – there are only about 40 of these animals here – which had apparently been killed in a road accident. The students were alerted to the photograph by their lecturer and locating the carcass would have enable them to retrieve its DNA for research. After initial attempts to get a cleaning services contractor to find the carcass turned up short, Ms Andie Ang, 26, and five other graduate students rushed at night to the accident site along Upper Thomson Road. After an hour of searching, a team member spotted a scratch on the road similar to the one in the photograph posted online. The challenge, however, was retrieving the DNA from the sample. Said Ms Ang: “As the blood was two to three days old, it could have degraded or have been contaminated by bacteria or the weather. Moreover, whole blood contains only a tiny amount of DNA, let alone impure samples of blood.” But after two weeks of numerous trials in the lab, they finally succeeded. The recovery yielded important genetic markers which the team will use to compare with other DNA obtained from faecal samples. For instance, a low genetic variation indicates a high degree of in-breeding, thus an increased probability of extinction. Lauding the students’ efforts, Nature Society Singapore president Shawn Lum said such DNA studies should be extended to all animal and plant species here, as it would go towards restoring the “viability and sustainability” of Singapore’s biodiversity. “It’s a miracle we found a usable blood sample,” Ms Ang said. Visitor to campus note: drive slowly, beware jaywalkers/students rushing to class; be early – allocate time for parking and walking to seminar venue. About the talk – The reality of human-forced rapid climate change presents an unprecedented challenge to the conservation of biodiversity. In this talk I will describe how the Wildlife Conservation Society (WCS), a science-based environmental NGO which works in 71 landscapes and seascapes in 41 countries across Earth, is tackling the challenge. As part of their strategic plan, WCS has always made a conscious choice to work in those areas that are in the most need – they are often in regions where other NGOs do not work and their ecology is little known. The vast majority of landscapes and seascapes WCS work in are therefore characterised by limited information on what the likely species and ecosystem responses are to climate change, and how current threatening processes will change. There is also often very limited government capacity to actually start to plan for and adapt to challenges climate change pose. WCS has implemented two strategies to start to plan for this challenge. First, in the absence of specific regional data, WCS encourages a holistic conservation strategy that incorporates a larger adaptation agenda – one that recognizes the importance of protecting and restoring those natural processes and responses that have enabled species to persist through past environmental change. Second, WCS is developing regionally specific adaptation frameworks to allow specific activities to be planned for, and implemented, in a number of landscapes. While the development of these frameworks are in their infancy, there are three different case studies from the Albertine Rift, Madagascar, and North America that highlight some of the climate adaptation activities being undertaken by the organization. Singapore’s Nature Reserves have remained surprisingly resistant to most plant invaders, except around the margins. Outside the reserves, however, invasive woody plants dominate or co-dominate large areas and may — although this is hard to prove — be preventing or delaying the development of native vegetation. There has been very little attempt to control alien plant invasions in Singapore, beyond the spot removal of conspicuous aliens in conservation areas and the removal of albizia trees from sites with public access. A more activist policy could be justified, however, since early eradication of new invaders is likely to be cost-effective in the long term. Singapore’s National Parks Board has asked the National University of Singapore (Profs Richard Corlett & Hugh Tan) to undertake a study on this topic. We are seeking an enthusiastic Research Assistant to join the research team. The successful candidate will be offered a one-year contract with a salary scale commensurate with experience and qualifications to be determined by the NUS Administration. Conduct a range of control measure experiments (uprooting, cutting with herbicide application, girdling, foliar spray with herbicide) for all the major woody invasive species in Singapore as well as problematic native species. Assess the relative effectiveness of different control measures mentioned above. Analysis and reporting of scientific data. Administrative support for the project. A valid driving license would also be useful, as would experience with supervising field workers. The closing date for applications is 15th May April 2011, but we may make a decision earlier. Singapore has had a long history of reforestation and related activities (enrichment of low-diversity forests, repair and enhancement of forest margins etc.) using native woody species, largely within the Nature Reserves and Nature Areas. Although a great deal of practical experience has been acquired during these activities, very little has been published, making it difficult for other people ― both within Singapore and overseas ― to learn from this experience. Carry out a retrospective field-based assessment of all well-documented past activities involving non-urban planting of native woody species in Singapore in order to identify, communicate and archive the major lessons that can be learned. Assess the survival, growth and competitive ability of the planted species in the field in relation to environmental variables (past land-use, soil, vegetation, canopy closure etc.) and compare the effectiveness of different nursery, planting, and post-planting management techniques that have been used. an interest in plants and, preferably, some field experience in SE Asian forests. The closing date for applications is 15th Apr 2011, but we may make a decision earlier.